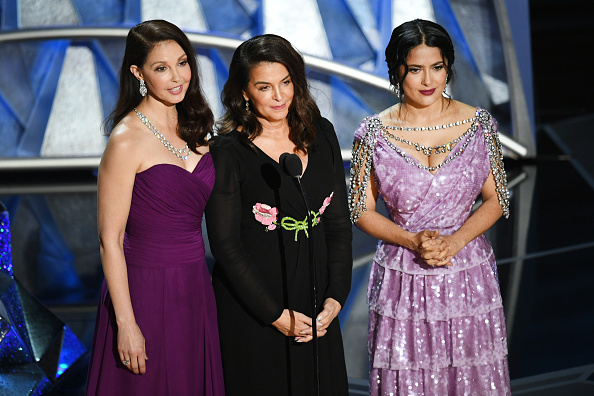 In one of the most powerful moments of the 2018 Oscars, Ashley Judd, Salma Hayek, and Annabella Sciorra took to the stage to introduce a video montage celebrating trailblazing creators in Hollywood. Before introducing moving clips of the year’s groundbreaking and record-setting creators, the three actresses and Harvey Weinstein accusers took a moment to honor the Time’s Up and #MeToo movements at the awards show. But in the fight ahead, we must remember that Hollywood has previously been promised reckonings that didn’t actually come. In the video montage that followed the stars’ stirring speeches, Geena Davis — Hollywood legend and founder of the Geena Davis Institute on Gender in Media — reflected back on another moment in entertainment history that could have been, but failed to be, different. When speaking of her groundbreaking 1991 film Thelma & Louise, Davis described hoping that film’s success would be a turning point for women’s representation on screen — but not much has changed for women or other marginalized groups in Hollywood. "This is now that moment." 1. Take Frances McDormand’s advice. She left the audience, and viewers at home, with two words: inclusion rider, or a clause in an entertainment contract that demands a certain level of diversity in the movie’s cast and crew in order to retain the actor or actress. If the entertainment industry has any hope of moving in a more inclusive direction, the people with power on set — often A-list actors and actresses — need to be willing to use their power to uplift others. An inclusion rider is a great place to start. 2. Hollywood has to put its money where its mouth is. In the last three weeks, the box-office record breaking success of Black Panther has once again proven that diverse movies can make serious money. In fact, the three highest-grossing movies of 2017 — Beauty and the Beast, Wonder Woman, and Star Wars: The Last Jedi — were female-led. The proof is in the numbers: studios can make more money if they are willing to invest in inclusive storytelling, casting, and hiring, behind and in front of the camera. So why is there still such a diversity problem in Hollywood? It seems the industry still doesn’t understand how profitable diversity can be. Hollywood is, after all, a business, and if the industry’s decision makers understand how they can financially benefit from inclusivity, they will be more likely to put their money where their mouth is and give money to women, people of color, and other marginalized creatives. 3. Consider diversity in front of and behind the camera. A frequently cited study by San Diego State University’s Center for the Study of Women in Television and Film revealed that the number of women behind the camera greatly affected the number of women who showed up on screen. On shows with female creators, 42% of the characters and 32% of the writers are female. On shows with male creators, however, only 35% of characters and a measly 8% of writers are female. These statistics highlight just how important it is to have representation behind the camera if you want to see representation on camera, but it isn’t all about the numbers. It’s also about accurate, truthful, and authentic storytelling. In an enlightening piece in Lenny Letter, comedian and SNL alum Sasheer Zamata shared her thoughts on Hollywood’s diversity problem and how to solve it. “If there is at least one person of color in front of the camera, there should be at least one person of color on the creative team,” Zamata explained, “and hopefully they can ensure the character stays a character and not a caricature.” If Hollywood makes room for more diverse voices in the writer’s room, the costuming department, the marketing team, and everywhere in between, they can help ensure genuine storytelling free from unchecked bias and prejudice. The people who are best at telling a story are always those who have lived it and experienced it. 4. Diversify the storytelling, not just the cast and the crew. Asian women face misogyny and racism in a multitude of ways and often times unreported. Not just in the movie industry and certainly not just in the USA. Diversity in Hollywood isn’t just about who is represented on screen, but how they are represented. When films portray marginalized groups as stereotypes, the objects of fetishism, or token casting, it can actually be more damaging to reaching equality and ending prejudice. If we want film projects to be more positively inclusive, we need to demand better storytelling choices from the industry. That starts by creating authentic, multi-dimensional characters for every person. The best way to make sure that the #TimesUp movement in Hollywood doesn’t become a missed opportunity for change? We need to keep talking about diversity, inclusion, intersectionality, bias, and prejudices within the entertainment industry and beyond. It is because of the brave voices of so many women, both inside and outside of Hollywood, that we are finally starting to see progress in the fight against abuse, prejudice, harassment, and inequality. Let’s keep the conversation — and the changes — going.